At Shady Pines Aviary all our breeder birds are fed twice daily. Fresh fruits and vegetables which are a major part of their diet are fed in the morning, and dry seed and pellets (no pellets for Brotos) are replenished each afternoon. Pairs with chicks also get additional servings of fruits/veggies throughout the day as needed so they have ample soft food to feed their family. Water bowls are flushed and refilled up to four times daily by our automatic watering system. Weaning babies are fed the same diet with emphasis on the soft foods. Dishes are refilled more frequently as they tend to play with it more than eat it. Cheerios are added to their dry mixture, as they seem to invite the babies' interest. Our pet birds enjoy the same foods as our breeder birds but with the addition of sharing the healthy portion of our meals such as eggs, pasta, rice, whole grain breads, cooked vegetables, and small amounts of lean, well cooked meat or poultry. They can also have yogurt, ice cream and cheese in moderation (just a taste as they are lactose intolerant) but remember NO chocolate, avocado, caffeine or alchohol! Our vegetable mix is prepared fresh every three days. We start with frozen corn and frozen peas, defrosted in a colander under running lukewarm water. To this we add fresh shredded carrots. We then add one or more of the following: broccoli, zucchini, yellow squash, beets, cooked sweet potato, greens such as kale, spinach or collard greens. All vegetables (except for the leafy greens) are coarsely chopped in a food processor to about corn kernel size. Freshly sprouted mung beans and lentils are added to the chopped veggie mix. In season, we also serve generous amounts of fresh corn on the cob, cut into "wheels." In addition to the veggie mix, each day we add fresh fruit cut into 1/2 - 3/4" cubes. Daily fare always includes apples, pears and grapes. According to season, several of the following are added: oranges, cantaloupe or honeydew melon, peaches, nectarines, plums, papaya, mangos, berries, cherries (pits removed), kiwi, and carambola (star fruit). Fortunately we have the space available and have planted quite a few fruit trees. We have already been harvesting citrus, papayas, and carambolas. Our pomegranates, mangos, bananas, and berries have not yet begun to bear fruit but we are ever hopeful. We plan to put in a vegetable garden as well, all a part of our effort to provide homegrown, pesticide free produce for our birds. Dried lentils and mung beans are soaked overnight then allowed to sprout the following day. While sprouting they are carefully rinsed and allowed to slowly drain several times during the day. Extreme caution must be used to not damage the beans which can cause them to spoil. The sprouted beans are added to our refrigerated chopped veggie mix, and are used within 3 days. Other choices for sprouting are adzuki beans, Chinese red peas, Canadian peas, or garbanzo beans. Additional white striped sunflower which is lower in fat. 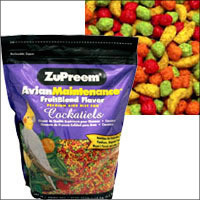 We add a small amount (maybe 5-10%) of ZuPreem fruity Cockatiel pellets (no pellets for Brotos). I am not an advocate of pelleted feed but offer a small quantity anyway. This will help especially the the weaning babies to recognize pellets as food in their future homes. They also get dried papaya and pineapple, raisins (sparingly due to high iron content), nuts such as cashews, walnuts, peanuts, pistachios, and almonds which are healthiest of the nuts. In addition, spray millet, whole grain breads and birdie corn bread are offered regularly as a treat. We start with basic Jiffy Corn Muffin mix and use 3 eggs, shell and all (I run them through the food processor.) Add at least one cup of any type of veggie, can be mashed sweet potato, or peas, corn, broccoli, squash (large veggies are chopped in the food processor.) For a variation, you can add chopped fruit such as apple, blueberries or cranberries. (I freeze cranberries at holiday time, then pop them in the food processor still frozen to chop.) You can also add some nuts and/or raisins. Let your imagination go wild. Bake either in an 8" square cake pan or as individual muffins using muffin papers. If using a mini muffin pan, you can give them the whole muffin, paper and all. Fruity cockatiel pellets on top look like colored sprinkles. Large muffins or cake pan will need extra baking time due to all the added goodies, test with a toothpick for doneness. Remember, NO Teflon or other PTFE coated non-stick pans which emit deadly toxic fumes when heated. Birdie bread can be frozen and thawed to use as needed. Have fun and the birdies will surely enjoy! Although all pairs are given cuttlebone, many pairs view it only as a destructible toy, I am not sure how much, if any, is actually consumed. For many years we have used a powdered calcium supplement. Starting with the 2007 breeding season, we switched to Cal-Mag with D , a liquid supplement which contains Calcium, Magnesium, and Vitamin D. This is mixed into their soft food several times a week during breeding season. Many of our pairs regularly multiple clutch and not a single calcium/egg shell problem has been encountered.